LEE BRADBURY applauded the determination and will to win shown by the Hawks in their 2-1 win against Bath City at Twerton Park. The visitors refused to be beaten even after the home side equalised eight minutes from the end. In response they went straight up the other end and regained the lead with a Theo Lewis header. Wes Fogden had earlier put the Hawks ahead three minutes into the second half. Importantly the win keeps the Hawks two points clear at the top of Vanarama National League South. 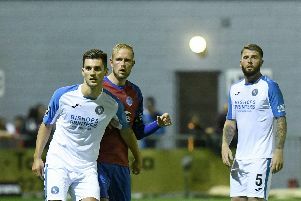 Bradbury regarded it as the perfect response after losing at Truro City in midweek. He said: ‘These are another big three points for us. ‘It was a real tough game and we can be proud with the way we fought. ‘After they equalised it would have been easy for us to lose the game. ‘Every player out there showed how much the Truro result hurt us. ‘We felt a little bit hard done by after that game but it was important that we raised our performance levels again. ‘There was a great determination to push all the way to the finish. The home side probably edged a closely fought opening 45 minutes which ended goalless. It was the Hawks who seized the initiative by taking the lead three minutes into the second half. Lewis beautifully chested the ball into the path of the onrushing Fogden inside the home area. Fogden made no mistake burying his shot into the bottom far corner of the net. Ryan Young pulled off an outstanding one-handed save to turn a header around the foot of the post. The Hawks again showed great discipline and organisation at the back. But eight minutes from the end however the home side levelled. Tom Smith lashed a ferocious shot into the roof of the net after the Hawks only partially cleared a cross. An uncomfortable finale looked on the cards for the visitors but instead they made an instant reply. Home goalkeeper Luke Southward missed a deep Rory Williams free-kick from the left and Lewis headed in from close range. ‘It is another game ticked off and we stay ahead of Dartford and Hampton & Richmond,’ said Bradbury. ‘With seven games to go we are in a good position. ‘Being top of the league means a lot to us and we want to stay there.